Ask fellow campers about "Bear Creek Provincial Park" and nearby attractions. Camped in a 35" motorhome. We are self contained so cannot comment on restrooms/shower facilities. Stayed in site #16. 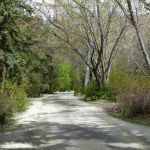 Pros - -	Site was level and pretty spacious -	Lots of trees and shade -	Great location to explore Kelowna, pick cherries, kayak lake, go wine or cider tasting and bike over the trestle at Myra Canyon Trestles. Cons - -	Pretty crowded in summer but the lake is so huge if you kayak you wont be crowded -	No hookups so no AC in the hot summer We camped at Bear Creek Provincial Park in a Motorhome. At this time of the year sites were first come first served, so we got lucky and were able to stay in one of our favourite ones - site 16. Campground was probably about 25% occupied during our stay. The sites at this campground are now 100% reservable from May long weekend to Labour Day weekend. Expect this place to be 100% full in July and August. There was an overflow area in the day use area at one time. Best to check if this is still the case. Our site was a level, gravel back-in that had a green space next to Bear Creek. Plenty of space on either side for privacy. The sites along the creek on our loop were shorter than the rest, but a 40 ft rig would have fit ours. Walking trail behind our site that accessed the creek or road to other parts of the park. No cable TV or Wi-Fi and satellite TV would be a challenge due to all the trees. Even though the park is only across the lake from Kelowna, wasn't able to get any OTA channels. Generator hours are 9-11am and 6-8pm. Firewood is available from the host. Only two of the campground loops were open with the third opening on the May long weekend. Loops 1-45 and 46-80 have a nicer landscape than loop 81-122. They also are close to the playgrounds and picnic area. As all campsites are basic with no utilities, there is a dump station with drinking water across the highway from the campground. Campground gates are closed between 11pm and 7am and host can open them up in an emergency. Across the highway is the Bear Creek Canyon Trail. It is a 5km, fairly steep, loop trail that has lookouts with views of the canyon and falls. Also a nice panorama of Okanagan Lake and the city of Kelowna. We would definitely stay here again. We camped at Bear Creek Provincial Park in a Motorhome. Enjoyed our quick stay here. Large campground. Sites are spacious. A fair drive from most places which made it difficult to pack up the motor home every time we needed something from town. Will look for a place next time a little closer to amenities. 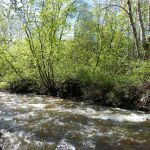 We camped at Bear Creek Provincial Park in a Motorhome. Beautiful lake and grounds and great ATV day trips way above the mountain hill side. An extremely clean campground and crystal clear water. Gravel sites. Staff is very accommodating and friendly here at Bear Creek: No Bears though! Great place for even the fussiest campers. Restaurants and shopping in Westbank are 10 minutes away by car. You will like it alot. We camped at Bear Creek Provincial Park in a Travel Trailer. 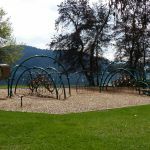 Park is located 9km west of Kelowna via highway 97 and north on Westside Road. Sani-station and drinking water available across the road from the campground. Sites along the creek in the old section very private and nicely landscaped. Steep trail leads to falls on the creek and spectacular views of Okanagan Lake to the east. 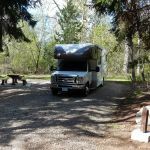 We camped at Bear Creek Provincial Park in a Motorhome. Are you affiliated with Bear Creek Provincial Park ?